This weekend, earn raffle tickets when you play a popular Christmas slot at Intertops Poker and Juicy Stakes. 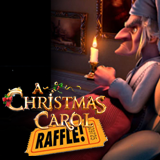 Play the A Christmas Carol slot by Betsoft December 15-17 and you'll get one raffle ticket for every $6 you bet. You can improve your chances of winning by playing more and getting more tickets. Winners will be randomly drawn and receive $1000 in raffle prizes. The first prize is $400. The holder of the ticket drawn second will get $250. The third place ticket wins $200. The forth and fifth place tickets will receive $100 and $50. All prizes from the raffle promotion must be rolled over at least once on Betsoft games in order to be withdrawn. Free raffle will award $1000 in prizes! Intertops Poker and Juicy Stakes are known all over the world for their busy poker rooms on the Horizon Poker Network. They also offer a selection of casino games from Betsoft, Worldmatch and Lucktap. A Christmas Carol from Betsoft is a 3D, HD version of the classic Dickens story. An animated Mr. Scrooge watches over the game’s reels as the Ghosts of Past, Present and Future visit. Three or more Christmas Past or Christmas Future symbols trigger up to 12 free spins. When the Christmas Present symbol appears, all Ghost symbols turn to Wilds. Birds, Betsoft’s newest game, features a flock of 3D-animated birds roosting on three telephone lines. Instead of spinning reels on, the three rows of birds flutter off and a new flock lands. The “Free Flights Tweet o’Meter” fills up with each winning spin, awarding free spins when it reaches the top. The epic Legends of the Nile is coming soon.